Fiat 500 Vintage ’57: the legend is back! Presented in world preview at the Geneva Motor Show, the new 500 Vintage ’57 will be revealed today at the Centro Storico Fiat in Turin where tradition is alive, passed on and renewed. Paying homage to the iconic Fiat introduced in Turin on 4 July 1957, the 500 Vintage ’57 special series has a retro look which picks up some of the key features of its classic precursor, like the pastel blue body – now in combination with white roof, spoiler, aerial and mirrors – and the tobacco or alternatively Brown Terra di Siena Poltrona Frau leather upholstery. The car is embellished by vintage style Fiat badges on the outside and on the steering wheel, a white dashboard fascia and 16′ alloy white and chrome-plated rims which are reminiscent of the tyres of yesteryear. 1957: the ‘great little car’ and emblem of mass motorisation, of which nearly 3.9 million would be sold and which would become firmly established in collective imagination, is introduced. The 500 Vintage ’57, the new special series which is a homage to the 1957 Italian icon, will be introduced to the press today in Turin at the historical Centro Storico Fiat in via Chiabrera 20. After the world preview at the Geneva Motor Show, Fiat has picked the Centro Storico to reveal the new 500 Vintage ’57 to the international press. The location picked for launching the car is perfect because since 1963 the historical building has housed a permanent exhibition which illustrates the establishment and the technological, social and economic development of Fiat by presenting all aspects of Fiat’s history through its huge document archives. Several exhibits are dedicated to the iconic 500, like the 1950s Mirafiori assembly line and the office of Dante Giacosa, the engineer who created the Nuova 500 in 1957. Available in saloon configuration only, the new Vintage ’57 special series has a vintage appeal which picks up some particularities of its predecessor, like the pastel blue paint, now combined with white roof and spoiler, and the tobacco – or alternatively Brown Terra di Siena – colour Frau leather upholstery. The car is embellished by vintage style Fiat badges on the outside and on the steering wheel, a white dashboard fascia and 16′ alloy white and chrome-plated rims which are reminiscent of the tyres of yesteryear. Marketed throughout Europe and available in 12 body colours, the new 500 Vintage ’57 will be available with various engines and different standard and optional equipment to satisfy the needs of customers in each country. Customers in the EMEA area can choose the 1.2 litre 69 hp, 0.9 Twin Air 65 hp, 0.9 Twin Air 85 hp or the 0.9 Twin Air 105 hp petrol engines, or alternatively the 1.3 Multijet 95 hp diesel. Characterised by complete standard equipment, the new special series complements the Fiat 500 2015 line-up, which today includes two configurations (saloon and convertible), four trim levels (Pop, Lounge, S and Vintage ’57), two transmissions (manual or Dualogic) and six engine versions (the petrol/LPG 1.2 litre 69 hp EasyPower in addition to the engines available for the Vintage ’57). The new Fiat 500 Vintage ’57 is the proper tribute to the legendary ‘Cinquino’, as the 500 was playfully dubbed, which from 1957 to 1975 contributed to motorise a rapidly evolving country becoming a cult model of which some 3.9 million were sold. The car was essential, even spartan, but it was the first to make the privilege of mobility affordable in less than three metres of length. The 1957 500 was equipped with a fuel-efficient 479 cm3 13 hp two-cylinder engine which touched a top speed of 85 km/h. Now, that was remarkable for its day. During the eighteen years it was manufactured, the 500 benefited from minor technical adjustments and new equipment but never lost its interclass particularity. The last 500 – the ‘R’ model, of which 340,000 were made – was launched in 1972, when its heir, the 126, was launched. The model was still successful although the times were changing. But that was not the end. Fifty years after the first model, in 2007 Fiat started driving into the future with a new way of interpreting the concept of car. 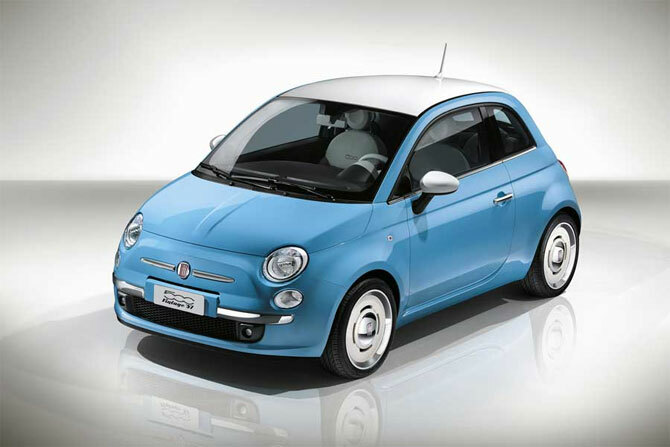 The new Fiat 500, the manifest of the ‘new Fiat’, was introduced. The model fully expressed Fiat’s most authentic tradition, that is to make technology and equipment available to all for the first time in a car in this segment. In brief, the 1957 500 invented a segment and the 2007 500 transformed it and broke many new records. For the first time, the model had an engine line-up which complied with strictest environmental and safety parameters even before they were to become mandatory. Euro 5 ready from the start, the 500 was the first compact – it was only 3.5 metres long – to be awarded five EuroNCAP stars and was the first to fit seven air bag as standard equipment and to make ESP available on the entire range. The car’s robust structure, active and passive safety and full equipment package did not negatively impact price: ‘safety first’ was a tough decision which confirmed Fiat’s intention to continue to lead in that area too. 500 soon revealed itself as a very successful breeding ground for new ideas: it was the first to be equipped with Twin Air two-cylinder engines, the first Fiat model to sport its own name as logo – a brand in the brand – and was the first in its class to have a very extensive array of equipment and customisation possibilities from the very start. Made since 2007 in Poland and since 2010 also in Toluca (Mexico), the Fiat 500 is sold in over 100 countries worldwide today and marked Fiat’s comeback to the United States. It is a truly global model of which over 1.5 million have already been registered. One of the secrets of its success is certainly the capacity of evolving and being interpreted in new ways – like the 500 Abarth (2008) and the exclusive 500 ‘Ron Arad Edition’, which is the most recent launched in 2014 – and also of exploring new territories, leading to the creation of a family of likeable, affordable cars for a wide range of uses to choose from – like the 500L (2012), the 500L Trekking, the 500L Living (2013) and the new 500X (2014). Today the torch is being passed to the 500 Vintage ’57 special series which is a proper homage to 1957 icon and confirms the undisputed leadership of Fiat in this segment.